A very nice piece taken from the Virginia Ki society website. There is, understandably a bias toward the Ki society style of Aikido but the outline it gives of the Four Principles of Ki apply to ALL style of Aikido practice, and are often neglected a little in the day-to-day training of non-ki focused styles. Well worth a read. Principles one and four of the above list are principles of the mind. This means that the mind is the primary focus of unification relative to these principles: keep one point, and extend ki. Principles two and four are principles of the body, and will be discussed later. The One Point is not a physical place in the typical sense of the word, but rather a point within the body upon which the calm mind may focus. It is really a state of mind. People often talk about the One Point being 2 – 4 inches (some measure it as precisely as 10 centimeters) below the navel. Such attempts at objectively describing a state of mind miss the point (no pun intended). By calmly focusing the mind on the lower abdomen, one becomes centered in the truest sense of the word. Physical movements, such as walking, are much more coordinated, while at the same time being very powerful. One may think of the One Point as the center of the universe. Since the universe is infinite, there is no single “center”, but rather infinite centers. Thus, each person’s One Point is the center of his or her universe. This universal mind/body centering creates a very powerful and calm feeling, which is very conducive to performing aikido. 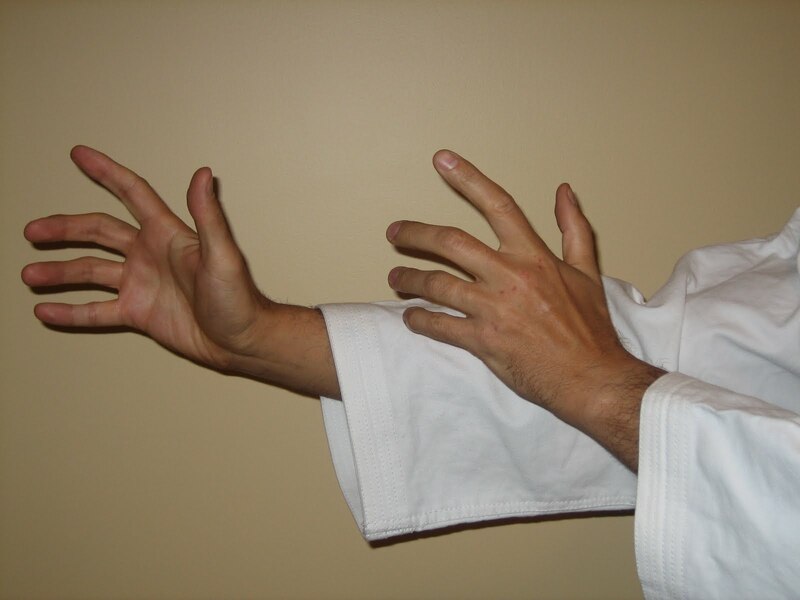 There are several tests which may be used to demonstrate whether a student has developed the ability to keep One Point, such as standing in hanmi (normal aikido stance) and being pushed gently by a partner on the upper chest, shoulder, and small of the back. If One Point is being maintained, it will be relatively difficult to move the person being tested. The position is maintained by simply holding your place, not by resisting through pushing back. Ki is a Japanese word which translates to, among other things, energy, spirit and power. In aikido, extending ki means extending energy. However, it does not mean to simply push with physical force. Rather it is a state of mind used to align the body to permit movement in a unified and calmly concentrated fashion. The classic illustration of ki extension is the Unbendable Arm test. The arm is extended in neither a rigid nor limp manner, but with a feeling of lively energy coursing through the arm from the One Point and extending out to infinity through the finger tips. This mental image produces an arm which is soft and pliable to the touch, but which is very difficult to bend. This feeling of dynamic energy extension is used in all aikido techniques. Without it, throws quickly become exercises in muscular tension, largely dependent on mere mechanical advantage and bulk. The remaining principles, relax completely and keep weight underside, are principles of the body. although the mind initiates the “body feel”, the primary focus of these principles is the state of the body. This is probably the most misunderstood of the four principles of mind and body unification. Complete relaxation in the sense in which it is applied in aikido is not the relaxation of a lump of jello, that of the “dead” relaxation. It is instead the sense of a body full of energy without tension. Complete relaxation goes beyond simple muscular relaxation into mind/body relaxation. A calm mind naturally produces a calm body. Removing stress from the body greatly enhances freedom of movement, which is so necessary in aikido. With all objects, weight naturally falls in the direction it is pulled by gravity, namely down. In human beings, however, it is possible to influence the manner in which the body “carries” its weight. The human body is not solid in the strict sense of the term, but is instead fluid. As water moves within a glass, so may the parts of the body “float” in relationship to one another. If one concentrates on the weight of the body being underside, or in the lower portion of the body, one finds that the body is very stable. if one concentrates on the upper body, of example the top of the head, the body becomes weight upperside and, as a result, unstable. When moving in aikido, it is important to keep your weight underside. This happens naturally if you are calm in mind and body, whereas tension automatically makes the body weight upperside. The good news is that it is easy to follow the four principles. If you follow one principle, the other are taken care of automatically. for example, if you keep one point, you are naturally relaxed, weight underside and extending ki. The bad news is that if you break one of the principles, the others are lost as well, for the moment at least. for example, if you are tense, you will naturally become weight upperside. All is not lost, however, for you can regain your composure in a moment, regaining all four principles in the process. There are several methods for developing the Ki energy. One of the best methods is known as ki breathing. This is usually done while sitting in the seiza position, pushing slightly from the abdomen. Once the air has been completely expelled, you may repeat the cycle, breathing in once more through the nose. Some people lean forward slightly at the end of the exhalation, bending at the One Point. At the height of their inhalation, they come back to an upright position. If you spend ten to fifteen minutes per day doing Ki breathing, particularly just before bed, you will find that it is very relaxing. Perform the breathing cycle for as long as you fell comfortable in your sitting position. Aikido is a moving art. The ability to move gracefully in response to the uke’s attack is an integral part of performing all aikido techniques. Keeping this goal in mind, it is therefore beneficial to perform exercises which devlope the body’s ability to move in a centered and coordinated manner. One of the activities which may be used to develop the sense of unified motion is fune-kogi undo, or the “row boat” exercise. Standing in left hanmi (stance; standing with the left foot forward), place your hands at the sides of your hips, palms facing towards the back, with your fingers cupped in a circle. Your thumb should be lightly touching the index finger. Imagine that you are holding the oars of a boat in your cupped hands. The movements begins by slightly pushing the hips forward, with the upper body following and maintaining a basically upright position, until the front knee is beginning to come over the top of the foot, but not past the foot. As the motion of the hips is about to end, thrust out both hands from the hips as if you are pushing the oars forward. The arms should be slightly bent at the end of this motion, and still relaxed. After the completion of the forward movement, bring the hips backward in the same manner as before until they return to the starting position. As they near the end of the motion, the hands are pulled back together as if pulling on the oars. When starting out, perform the exercise to a count of 1-2-3-4, e.g. hips-hands-hips hands. After you have the hang of performing the motion smoothly, you may progress to a count of 1-2, e.g. forward backward (with hand motions). If you like, you may have a partner test you by gently pressing forward on the small of your back during the forward motion to see whether you are leaning too far forward. If the partner grabs you by the wrists from the front, you may test the amount of forward extension and balance you are achieving on each forward and backward movement. [Editor’s note: in other words, your partner should not be able to tip you off balance from either direction] A related exercise is ikkyo undo. This involves the same hip motion as fune-kogi, but the hand motion is different. The hands begin hanging loosely at the sides in a natural bend. As the hip motion is nearing completion on the forward swing, the hands swing up on both sides until they are approximately at eye level and exteded forward. Next the hands swing back down, with the hips picking up the motion to complete the backward cycle. Therefore the movement count for ikkyo undo might be described as hips-hands-hands-hips. Rolling backwards and forwards from a cross-legged sitting position is also a good Ki development activity. begin the roll backward by gently releasing the hips, moving back from the one point. As you come back forward, extend you mind forward, returning to an upright sitting position. Once you’ve achieved a feelign of balance in basic rolling, you may progress to rolling backwards, coming forward and standing up. As you come, forward extend one leg forward and extend your midn forward as if to shake someone’s hand outstretched in front of you. You will find it surprisingly easy to stand. If you try the exercise without extending your mind, you will find standing very difficult. If there is a Ki Society dojo in your area, you’re in luck. The concepts of Ki devlopment are integral to performing Ki-aikido. Other types of aikido may also teach ki principles, but in a slightly modified style. Visit the school and ask to observe a class. Most dojos will let you attend an introductory class for free. As with most things in life, regular practice is required to achieve any meaningful level of change in your ability to remain calm in stressful situations, and to have some success in applying ki principles in daily life. Change takes time and practice. Particularly in the beginning, don’t place too much importance on the speed at which you progress. Don’t expect miracles to happen. It takes time to develop and understadning of the relationship between the Ki principles and events in daily life. In time, you will see improvement, so be patient. Remember, the expert was once a beginner too.